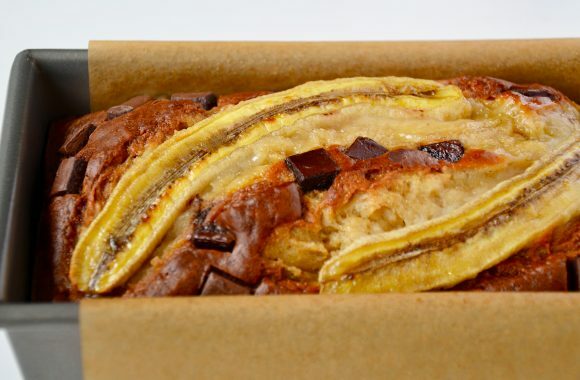 Bake up the best loaf with a tried and tested recipe for Sour Cream Banana Bread studded with chocolate chunks and topped off with an entire banana. Would you believe me if I told you that this recipe for Sour Cream Banana Bread marks the 15th banana bread recipe to grace these pages? Fifteenth! Banana bread has always been a staple in our house, from the original recipe my mom passed down to me to the dozen-plus iterations it has transformed into. 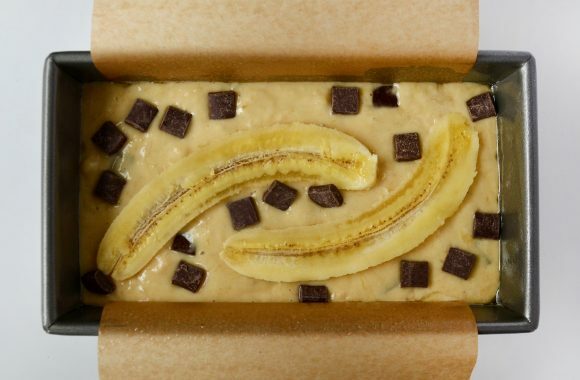 The Ultimate Moist Banana Bread! But this new recipe marks my personal favorite of the bunch. 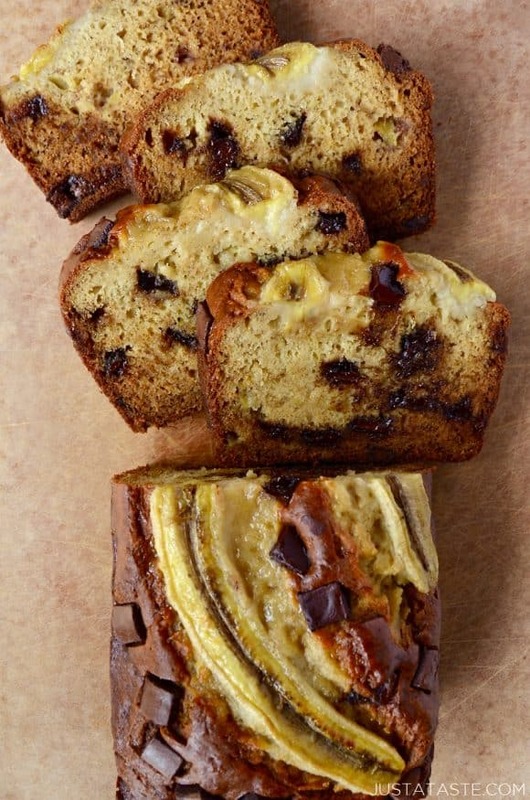 I’ve worked in every best element from the previous 14 recipes to arrive here: a super moist loaf with big-time banana flavor. Stir in some semisweet chocolate chunks and you have my dream breakfast bread, sliceable snack and dream dessert! Preheat the oven to 350°F. Line a 9-inch loaf pan with parchment paper leaving an overhang on the two longer sides. Grease the parchment paper with cooking spray. In a large bowl, whisk together the flour, sugar, brown sugar, baking soda and salt. 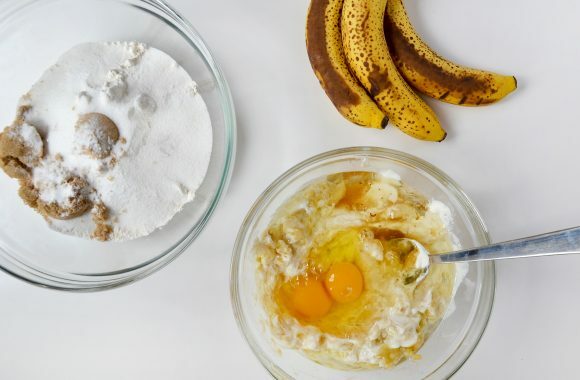 In a separate medium bowl, whisk together the mashed bananas, sour cream, eggs, vegetable oil and vanilla extract. Add the wet ingredients to the dry ingredients, mixing just until combined. 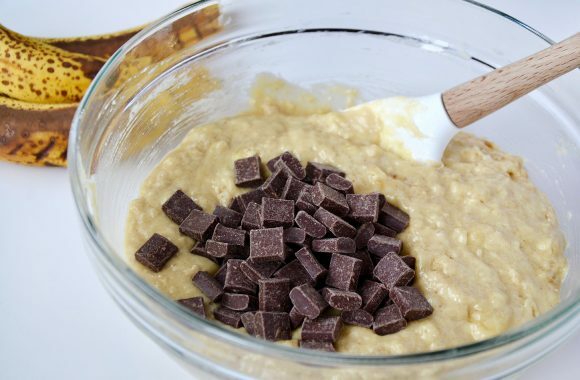 Stir in chocolate chunks, then scrape the batter into the prepared loaf pan. Bake the bread for 50 to 60 minutes or until a toothpick inserted comes out clean. Remove the bread from the oven and allow it to cool in the pan for 10 minutes before using the parchment paper overhangs to lift the loaf out of the pan and onto a rack to cool completely.